What is the DAYS360 Function? 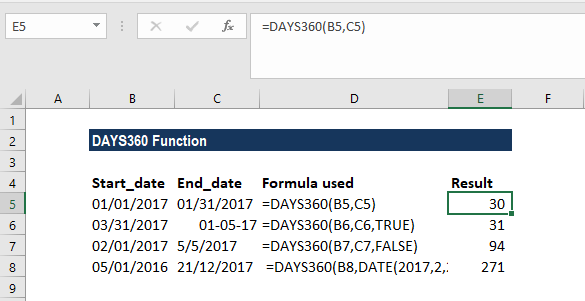 The DAYS360 Function in Excel is categorized under Date/Time Function. This function helps to calculate the number of days between two dates based on a 360-day year. As a financial analystFinancial Analyst Job DescriptionSee a real Financial Analyst Job Description including all the skills, experience, and education required to be the successful candidate for the job. Perform financial forecasting, reporting, and operational metrics tracking, analyze financial data, create financial models, the DAYS360 Function in Excel becomes useful in preparing reports such as an Aging schedule for debtors or computing payments schedule for accounting systems that are based on twelve 30-day months. Start_date – This is a required argument. It is the start of the period. End_date – This is a required argument. It is the end of the period. When the starting date is the last day of a month, it is set as the 30th day of the same month. If the start date is the last day of the month, the end date is set to the 1st of the following month. Otherwise, the end date is set to the 30th of that month. True – European method used. Here, the starting dates and ending dates that occur on the 31st day of a month become equal to the 30th day of the same month. The DAYS360 function will return a numerical value. 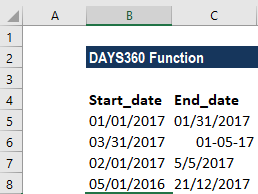 How to use the DAYS360 Function in Excel? The formula used in D2 and D4 omitted the method argument so this function used the US (NASD) method. Remember that the start_date and end_date arguments that were supplied should either be cell references or as values returned from functions (in cell D4, the DATE function is used to supply the end_date argument). The DAYS360 function calculates the difference between two dates and tells us the number of days. It assumes that there are 30 days in each month. The 30-day assumption is important in calculating the year difference between two dates. The result is the year difference between the two dates. On a similar basis, we can find out the difference in months. #NUM! error – This occurs when the start_date and the end_date arguments are numerical values but are not recognized as valid dates. One or both of the given arguments – start_date or end_date – are text values that cannot be interpreted as dates. The arguments given are non-numeric.